Uniquely situated in the northern reaches of the Serengeti National Park, and with unrivalled access to the short grass plains adjacent to the Maasai Mara National Reserve, sits the Lamai Wedge. This slice of Africa has just one camp: The Serengeti Mara Camp. Sitting amidst this ancient and sacred land between two of conservation's great success stories, Serengeti Mara provides an exclusive mobile camp experience - quiet, beautiful, remote. You are miles from home, but it feels like you're among family. For the first time in your life, you're contemplating the abstract notions of time and space. This is what Africa does. Verdant rolling hills stretched out before you are punctuated by pockets of woodland. These acacia thickets conceal creatures that remind you of your new place in the food chain. Sights, smells and sounds remind you this is a slice of paradise on earth. Nestled on a ridge of acacia trees and with an unrivalled and uninterrupted vista of the Serengeti's long-grass plains and Maasai Mara National Park, Serengeti Mara Camp is a picture-perfect destination. Being the only camp in the Lamai Wedge, it's a private, intimate and truly unspoilt wilderness. Sleeping under canvas beneath the enormous starlit Lamai night sky is guaranteed to be truly special experience. 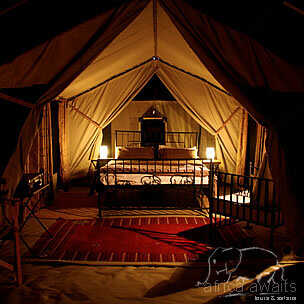 The camp consists of six luxurious and stylish walk-in tents, all with en suite toilets and showers. Guests enjoy an authentic camping experience within a totally wild environment without sacrificing any of the comforts of home. A larger tent provides the living space for dining and relaxing, with tables and chairs, sofas and a well-stocked reference library. Each tent can be booked individually or, if you're a group of eight or more, you can rent the whole camp exclusively! A day at Serengeti Mara Camp begins with freshly brewed tea or coffee deliver to your tent at which ever time you desire. Serengeti Mara’s intimate size makes dining a highly variable experience for our guests. Breakfast and lunch are usually served in our large Pavilion tent, but can also be served as a bush breakfast next to the Mara River or as picnic lunches during longer game drives. Evenings begin with a sundowner drink around an open fire over looking the stunning Lamai Wedge. Surrounded my animal sounds dinner is served (weather permitting) under the vast star covered sky. Our meals are prepared to the highest standard using wholesome fresh produce, offering plenty of choice and good vegetarian options where required. Incredible vistas aside, Serengeti Mara is a wildlife treasure trove. The annual wildebeest migration, which occurs from June to November in the Lamai Wedge and surrounds the Serengeti Mara Camp, is undoubtedly one of the world's most spectacular natural events. As well as the wildebeest, you'll enjoy exciting experiences such as nightly lion, leopard and hyena calls, trumpeting elephants and predatory cats hunting their prey in front of your very eyes. Couple this with superb bird watching, and we're sure you'll agree that Serengeti Mara Camp serves it up all and in abundance every day. From Serengeti Mara Camp, our comfortable open-sided Landrovers take you on tailor-made game drives or pick you up from professionally guided walking safaris. You can make a day of it with a bush breakfast or full-day picnic lunch, spent under the shade of an African acacia next to the crocodile-infested Mara river. Whatever you decide to do, we will make your days spent here are truly memorable. No where in the world is there a movement of animals as immense as the wildebeest migration, over two million animals migrate from the Serengeti National Park in Tanzania to the greener pastures of the Maasai Mara National Reserve in Kenya during July through to October. The migration has to cross the Mara River where crocodiles will prey on them. This is one of the highlights as the animals try and cross the Mara River alive. 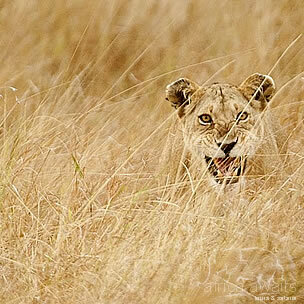 In the Maasai Mara they will be hunted, stalked, and run down by the larger carnivores. The Maasai Mara also has one of the largest densities of lion in the world. The Migration is rarely ever the same in terms of precise timing and direction, as local conditions influence grass growth. This means that the wildebeest may move off the open plains earlier in some years and remain in the northern woodlands for longer in others. 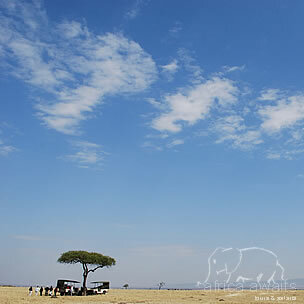 With your holiday, safari or business trip from in to Serengeti Mara Camp in Tanzania.